Hermes is a designer brand that holds its value well– check out riceandbeansvintage.com for other such designers, like Chanel, Louis Vuitton, and Christian Louboutin! I will be the first to admit: fashion is an investment. Sure, we’ve all been sucked into buying those $2 tank tops and $5 sale tops during one clearance event or another and walked out of the store thinking “Yes! Deal of the century!” Fast forward 10 washes later, and that cheap-o shirt has lost its shape, its color, or its stitching. And off it goes into the back of the drawer and the newest deal replaces it. Even knowing this I still get surprised I own 15 black t-shirts and 12 pairs of verrrrry similar dark wash jeans every time I do a much-needed closet cleanout. What can I say? I’m a sucker for a sale. BUT—and here’s a big BUT—the pieces I’ve spent a little more on, splurged a little more of that hard-earned money – those pieces tend to stand up to daily life better because they start out with a higher quality base. This is not true of everything, of course, but if looking good makes you feel good, and investing in some key pieces is important. 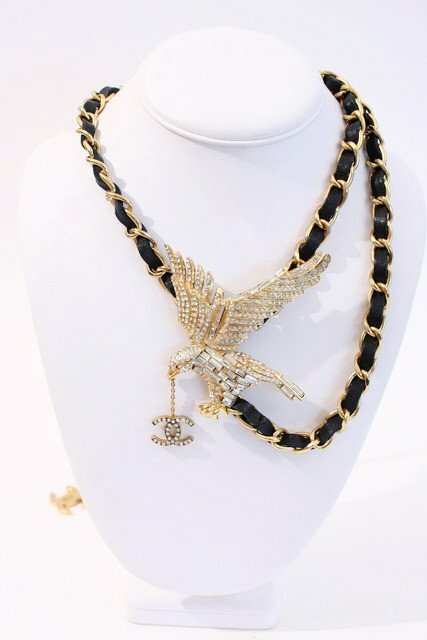 Vintage Chanel eagle necklace (or belt), for sale at Rice and Beans Vintage. So now let’s get to the good stuff. Just because you pay a little more for a piece doesn’t mean you’re completely throwing your money away and you’ll never see that investment returned to you. 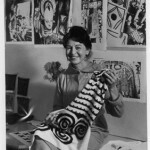 Here’s the great news: vintage designer pieces of particular designers are always a good investment. Vintage pieces are less expensive than what’s currently in stores, and they still hold their resale value well. Vintage Chanel ballet flats. Visit riceandbeansvintage.com for more details. A recent study that was highlighted in Christina Brinkley’s Wall Street Journal article “Ranking the Resale Value of Designer Fashion Labels” showed that brands that are not easily found on sale tend to hold their value better than those that do—so an investment in Chanel and Hermes pieces, for example, is a smart move. The study also showed that darker colors tend to hold their value better than lighter colors—probably because it hides the imperfections and stains better, which is also why my wardrobe happens to be primarily darker colors (I know I’m not alone there, so you may as well just admit it). 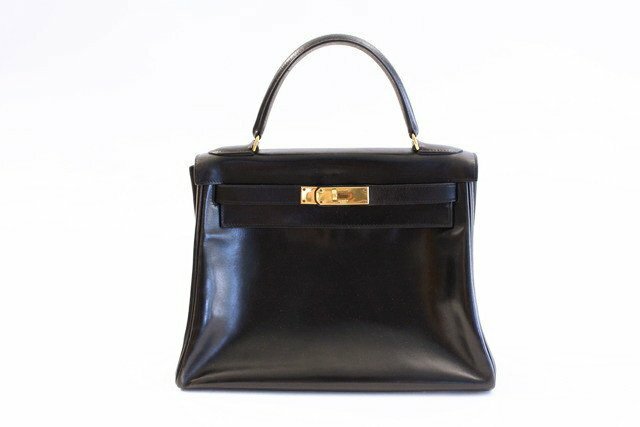 Vintage Hermes Kelly bag, for sale at Rice and Beans Vintage. 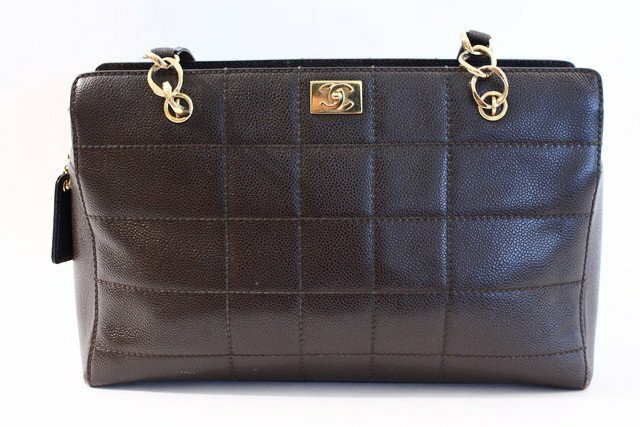 For sale at Rice and Beans Vintage: vintage Chanel caviar leather tote. 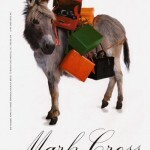 Written by Heather Cox for Rice and Beans Vintage. The Top 3 Reasons Why to Buy Designer Vintage!